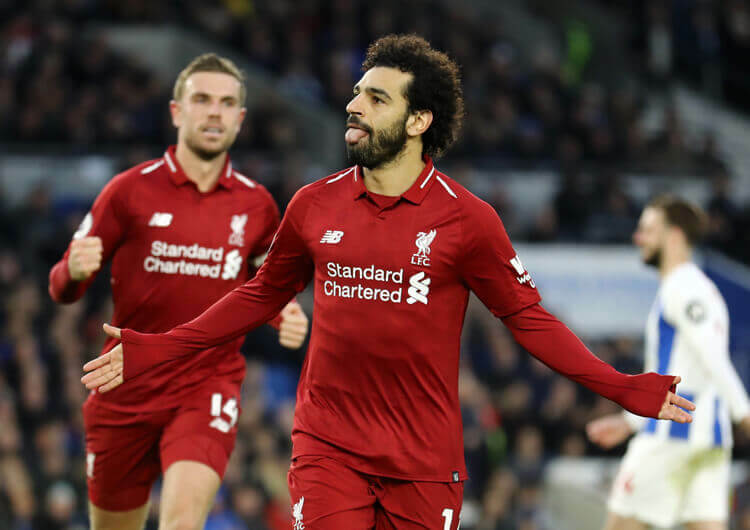 Liverpool maintained their lead at the top of the Premier League table with a dramatic and often fraught victory over Crystal Palace at Anfield. The Reds haven’t lost a home game in the league since a Christian Benteke brace gave the Eagles a 2-1 win there in April 2017, but it looked like history might repeat itself when Palace led 1-0, through a superb Andros Townsend goal, at half-time. 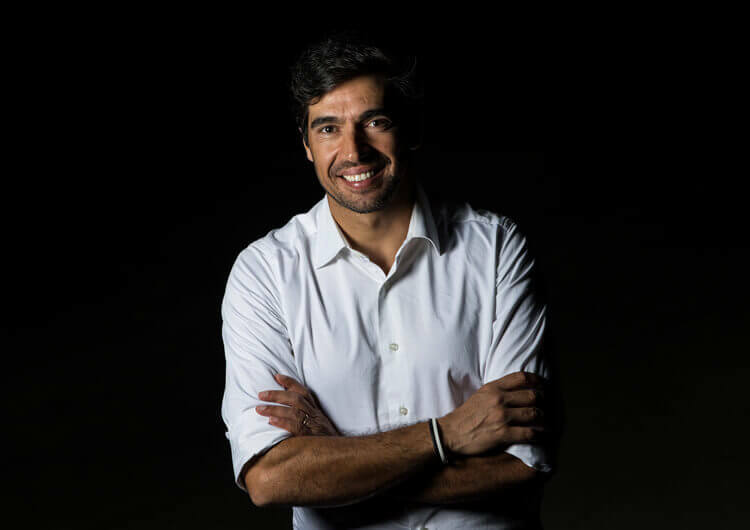 Within eight minutes of the restart, goals from Mo Salah and Roberto Firmino saw a revitalised Liverpool into the lead, but James Tomkins drew Palace level 10 minutes later. A desperate Julian Speroni mistake in the visitors’ goal gifted Salah a second and Liverpool a crucial third, but the drama continued when James Milner, who had endured a torrid afternoon against Wilfried Zaha at right-back, was dismissed for a second yellow. Sadio Mane looked to have killed the game with a strike deep into added time, only for Max Meyer to pull one back as full-time approached. But Liverpool hung on to complete an important if not comfortable victory. Liverpool set up in their now familiar 4-2-3-1 formation, with Fabinho and Jordan Henderson as the deeper-lying central midfielders. Naby Keita, Roberto Firmino and Sadio Mane played just behind Mo Salah in a typically fluid attacking four. Jurgen Klopp’s men had a significant amount of possession and were generally allowed to bring the ball freely into the Crystal Palace half. 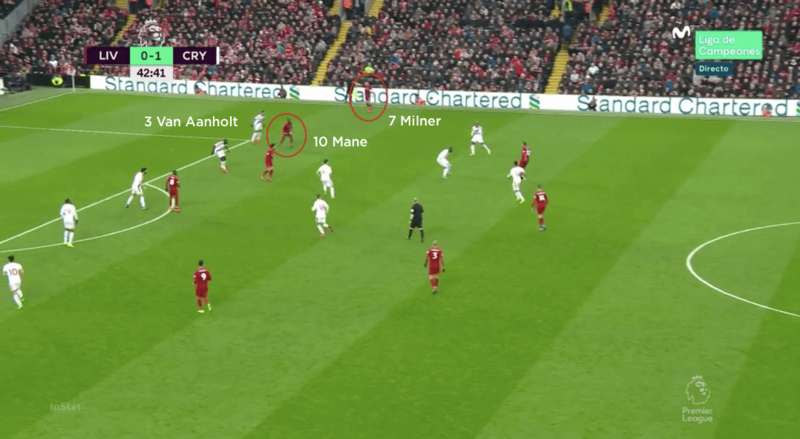 In the first half, however, they really struggled to break down a very organised Palace side – and leaving Joel Matip, Virgil van Dijk, Fabinho and Henderson behind the ball left the remaining six outfield players to try and unlock a defensive shape that often had all 10 outfield players behind the ball. 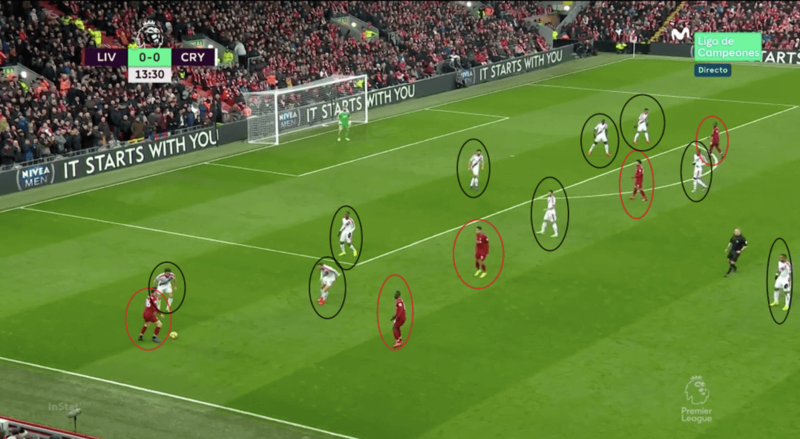 The Reds tried to use diagonal switches of play, using their full-backs as the stretching players. 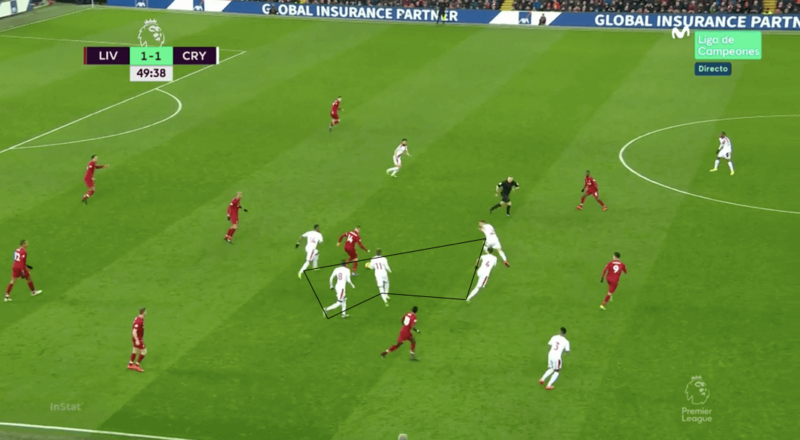 If Palace stayed horizontally compact, this would create a free man out wide for Liverpool; if they spread to deal with the wide threat, this could create pockets of space for the home attackers to receive and play between the lines. 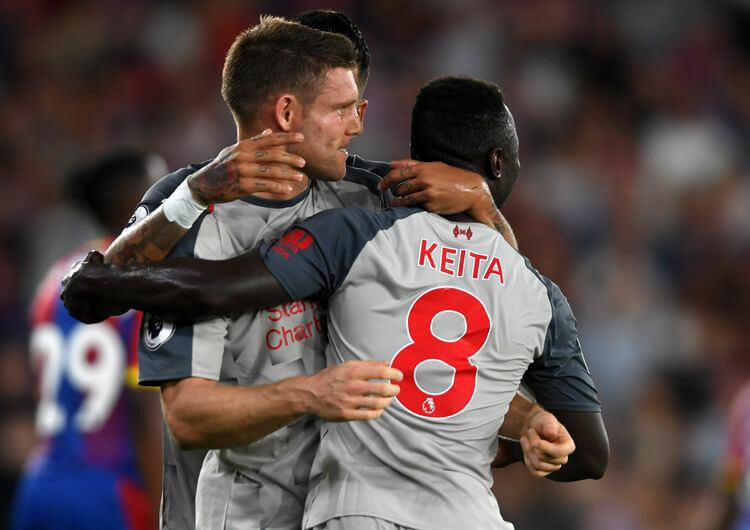 It was from one such diagonal switch that James Milner crossed for Salah to score the home side’s crucial third goal, albeit via a disastrous intervention from Julian Speroni in the Palace goal. 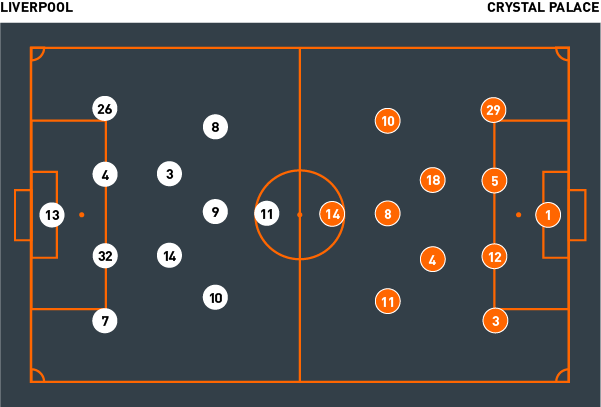 Liverpool also used shorter horizontal passes as a trigger for rotation between the lines. As Palace would look to shuffle across to their new position with the ball as their reference point, Salah and Mane would move against the momentum of the Palace shift to create a passing line on the blindside. 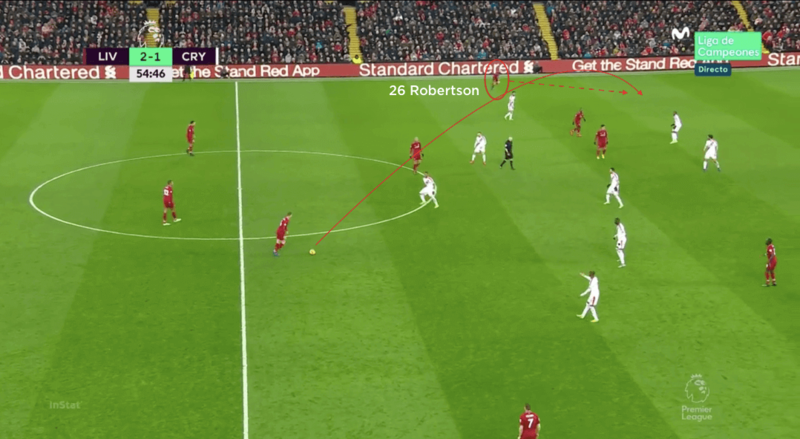 When these passes were successful, it would often pull the Palace defensive line closer together – which would in turn create overload opportunities out wide for full-backs Milner or Andy Robertson. Out of possession, Liverpool looked to press Palace high in a 4-2-3-1 shape or drop off into a 4-4-2, with Keita and Mane dropping either side of Fabinho and Henderson to create a midfield four behind Firmino and Salah. Due to their dominance in possession, however, the majority of their defending came in transition. The first objective here was to apply an immediate counter-press through the nearest players to the ball upon losing possession; if this was breached, then they would drop back towards goal and show Palace away from the centre of the pitch while more players recovered. Late on in the game, Liverpool packed their own box with numbers whenever Palace advanced up the pitch. 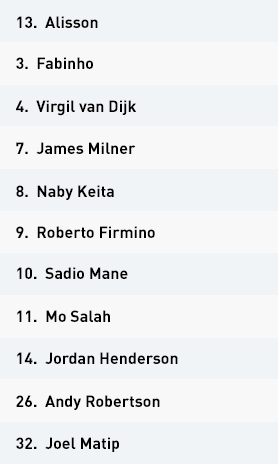 This included the likes of Salah, Firmino and Xherdan Shaqiri, although Mane would be left up as an outlet for clearances and an immediate counter-attacking threat. 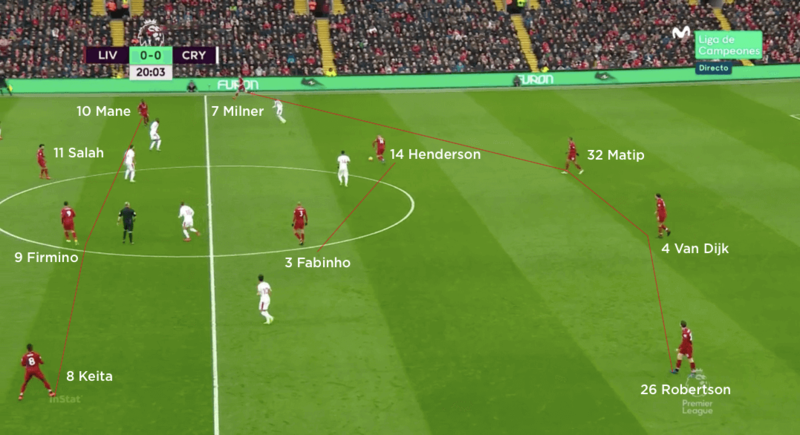 Liverpool set up in a 4-2-3-1 formation in possession, with Jordan Henderson and Fabinho operating as the two deeper-lying midfielders. The Reds had serious numerical issues in the first half, when they often had only six players – the attacking quartet and the two full-backs – trying to find a way through Palace’s heavily stocked defensive units. The hosts would look to use horizontal passes to initiate rotation and receive between the lines to create two-on-one opportunities against the Crystal Palace full-backs – as here, with Sadio Mane and James Milner isolating Patrick van Aanholt on the Palace left. 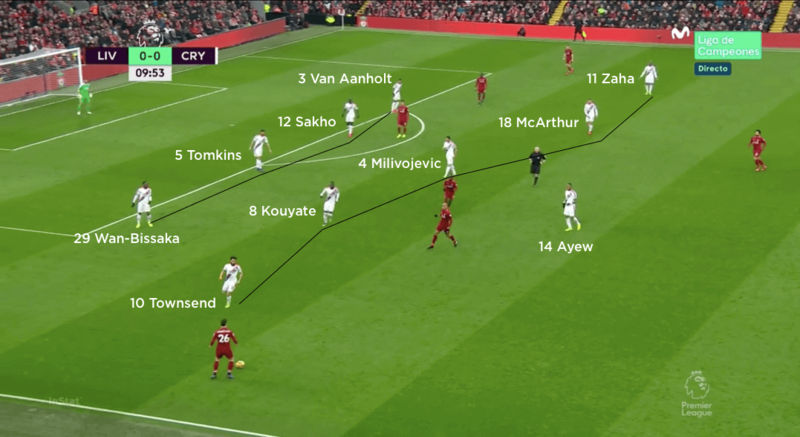 Liverpool used their full-backs to stretch the Palace defensive unit, offering either a direct pass around or over the visitors, or stretching them out to create space between their lines. Crystal Palace used a 4-2-3-1 formation in possession, with Cheikhou Kouyate operating just behind Jordan Ayew, and Wilfried Zaha and Andros Townsend as the wingers. The visitors used a very deep and compact 4-5-1 out of possession, with Zaha and Townsend dropping alongside the three central midfielders in the midfield line of five. Palace’s central midfielders would try to use their cover shadow to screen the passes into Liverpool’s attackers. They would use an immediate and intense counter-press in transition, but then look to recover quickly if it was broken. Palace would show Liverpool outside, and then funnel them back inside, where their midfielders were ready to jump out and press. 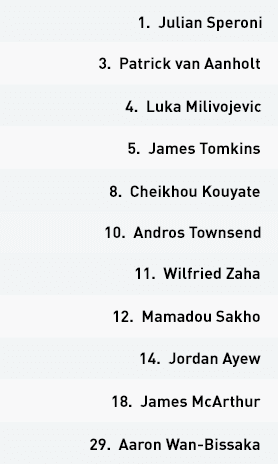 Roy Hodgson set his Crystal Palace team up in a 4-2-3-1 shape in possession, with Luka Milivojevic and James McArthur as the deep central midfielders. Wilfried Zaha and Andros Townsend provided the threat on the wings, with Cheikhou Kouyate operating as a central attacking midfielder just behind Jordan Ayew. The use of Kouyate in this role was to help facilitate their direct play, providing another option high up the pitch for Julian Speroni, James Tomkins and Mamadou Sakho to try and hit. Palace registered only 37 per cent of possession over the 90 minutes, but this was part of their strategy to concede possession and space while carrying a real threat on the counter-attack and through direct passes. 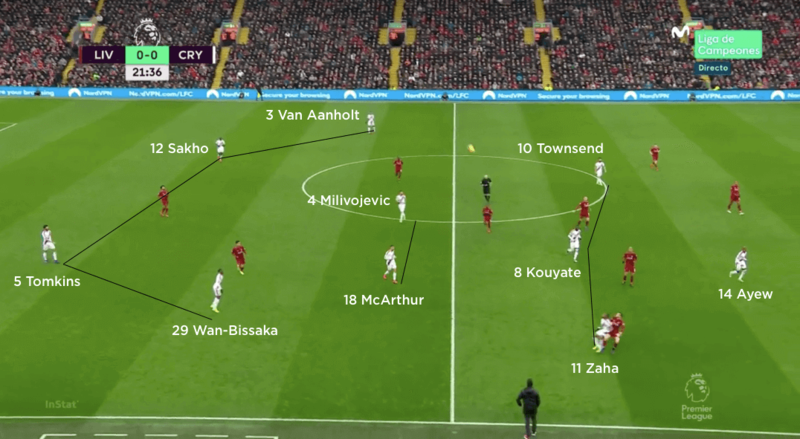 With James Milner and Andy Robertson often playing ahead of Zaha and Townsend, it left the two Palace wingers in good positions to exploit the space in behind the Liverpool full-backs in transition. When this ball in behind wasn’t an option, Palace were more than happy to play to Ayew’s feet and for him to bring others into play. They also looked to play to the feet of Zaha or Townsend – but preferably the former – and get them driving at the Liverpool full-backs to create opportunities or draw fouls or corners from which they could create set-piece opportunities. It was no surprise that Zaha was influential in almost everything the visitors did in attack, nor that his pace and trickery led to the second-half dismissal of a weary Milner. Out of possession, Palace set up in a 4-5-1 low block with Zaha, McArthur, Kouyate, Milivojevic and Townsend across the midfield. 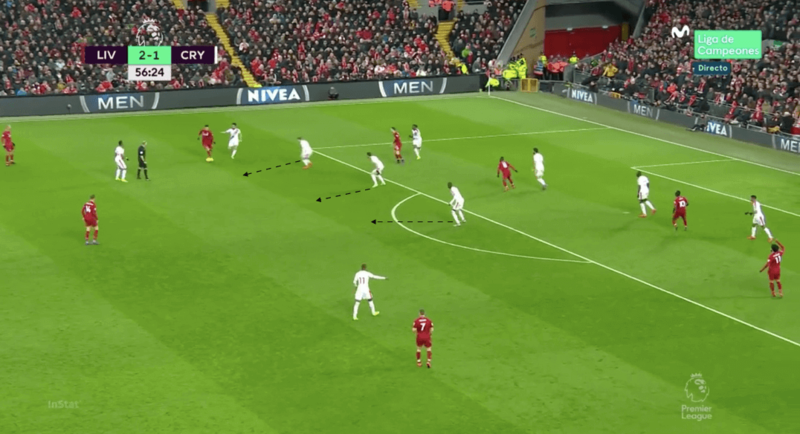 They made their intentions clear from the first minute, that they were not going to press Liverpool in their own half, but would drop inside their own half and allow the Reds to come to them. This reduced the space both in behind the defensive line, and between the defensive and midfield units. 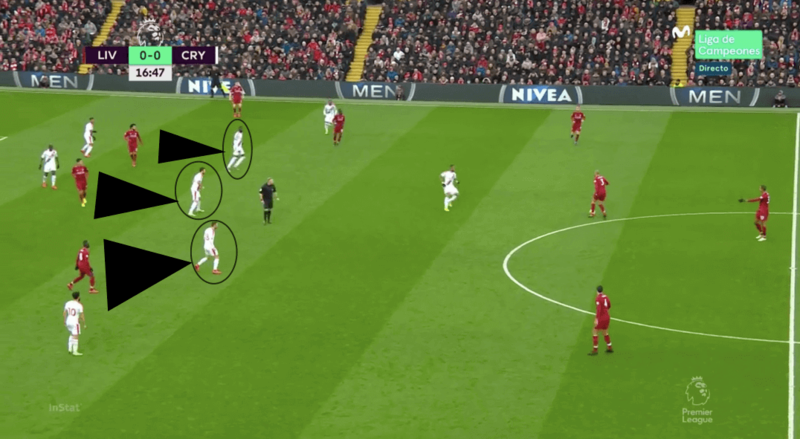 As Liverpool brought the ball over halfway, the distance between defence and midfield would typically be approximately 12 yards, with 10 yards between each individual in the midfield unit. As the ball got closer to Palace’s defensive third, the space between the units would reduce by about half, making it very difficult to play through. The visitors would also look to show Liverpool out wide; once there, they would use both full-back and wide midfielder to show the Reds back inside, where three Palace players would be on the front foot, ready to jump out and close down should the Liverpool player drive inside. Centre-backs Sakho and Tomkins would drop with the movements of the Liverpool attackers for two or three yards before passing them on to their midfielders, who would use their cover shadow to screen the passes from Henderson and Fabinho into the front four. In transition, finally, Palace would look to apply an immediate counter-press but sprint back to their defensive positions if it was broken.